Bluefin was kind enough to give us an early look at their booth for Toy Fair 2019. We’re going to swing back around later this weekend, as just a few items weren’t set up just yet. Here is the Bandai Tamashii Nations Dragon Ball display with S.H. Figuarts, Figure-Rise Standard, Figure-Rise Mechanics, and FiguartsZERO. Time to wrap up our look at the S.H. Figuarts Dragonball Z / Super exclusives with a round of more artistic shots. We wanted to get those base shots out quick over the weekend so people could see what they could expect and get some comparison with older versions. Now the fun stuff :). Broly, Cell and Vegito will all be available at the Dragonball Tour stops across North America for the rest of the year. The first stop of that tour – San Diego Comic Con! Each will come in event exclusive packaging, with Vegito getting a SDCC package variant just for that one show. We will add in these shots to round them out, and link them on the SHF DBZ Reference Guide as well. Oh, and right before these came in, we dropped the recent DBZ Majin Vegeta gallery too! Read on to check out over 35 more HD shots of these guys in action courtesy of Bluefin Brands and Tamashii Nations! Ok, last up in our first pass galleries for the SDCC / Dragonball Tour S.H. Figuarts exclusives is Vegito! Or Vegetto, depending on which one you get. There are two versions of this figure due out this year. The figure itself – exactly the same, the box however is different. SDCC will get a special box with SDCC branding along with Funimation and Bluefin Brands logos on the box, and the name will read Vegito. The remaining Dragonball Tour stops will get Vegetto, the Japanese spelling of his name, and have Japanese centric branding on the front, and back of the box. The insert for the SDCC one will have the SDCC logo, and the rest will have “Event Exclusive”. Broly and Cell will not have SDCC box variants, just Vegito. Broly and Cell will however be available at SDCC too. Now on to the figure. Again, it’s solid. I was never a fan of the original for whatever reason. The hard plastic and loose joints killed it for me. This one however has a bit more heft, a denser, more-matte plastic. The richer tones mixed with the SSGSS blue hair pops. Just like the exclusive Cell, I was surprised how much I dug it after having it in hand. In all we get 5 faces, 3 SSGSS and 2 regular. 3 sets of hands plus a single for the accessory, which is the energy blast Vegito is known for. He also has a folded arms piece. In all, it’s the same mold and accessories as the previous release in new colors. I’ve really been enjoying the modern era DBS (& related) figures, so having this guy in rotation is welcome. Read on to check out 55+ intro shots and check back tomorrow for some more shots of all 3 exclusives! 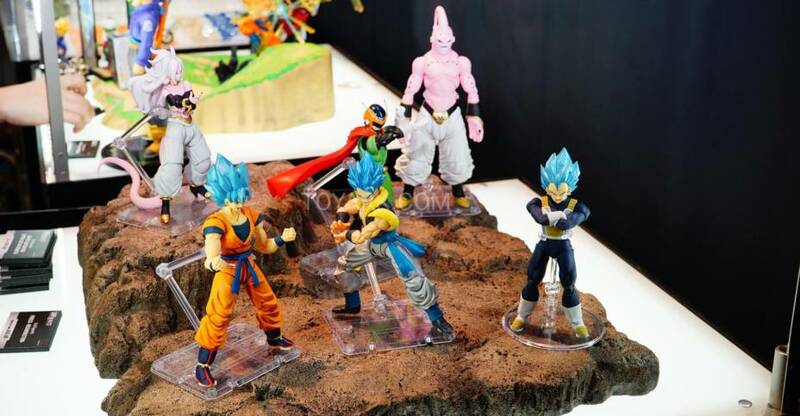 These are courtesy of Bluefin Brands and Tamashii Nations, and will be available at all Dragonball Tour stops throughout the rest of the year. First one being SDCC in under 2 weeks! The next S.H. 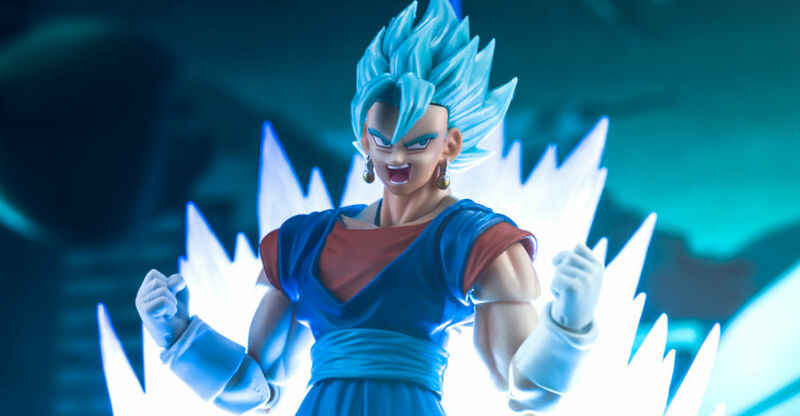 Figuarts Dragonball Z figure started to hit state side earlier this month and The Toyark is continuing it’s galleries of them today with Vegetto! Vegetto is the combined form of Goku and Vegeta, fusing together using the Potara Earrings to battle Majin Buu in the show. He uses the Goku mold as a base with a new head, forearms and feet to represent the Vegeta portion of the fusion. We’ve done up over 50 shots of Vegetto in action, so check him out after the break along with our quick thoughts! 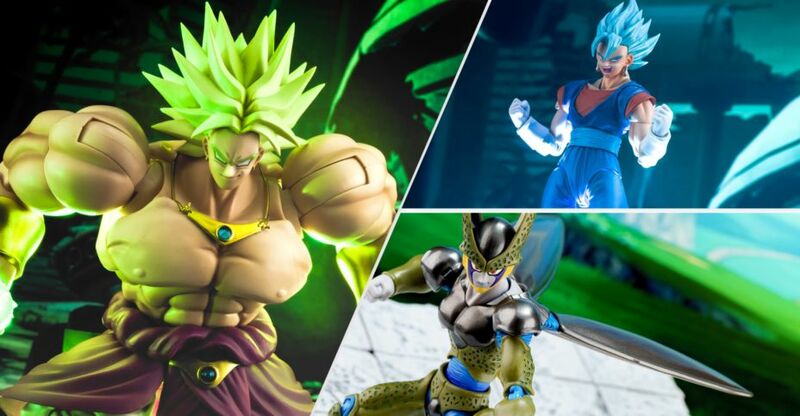 Bandai Tamashii Nations is holding an event showing off new goods from a wide array of properties, and Dragonball Z had a ton of new products revealed. From the S.H. Figuarts line we now have Buu, times two. Super Buu with Gohan absorbed, and Super Buu with Gotenks absorbed. Also seen was a full on Super Saiyan 4 Goku. Couple that with a Buu Saga adult Gohan, and the previously seen Vegito and it’s clear S.H. Figuarts will be moving to a Buu Saga theme next year. We also get a look at previously seen or released figures like Android 17 and Android 16. Along with these S.H. Figuarts figures were a selection of new Effects pieces. Green Wind, Electricity, Clouds, Wilderness (perfect DBZ accessory), Energy (Alpha), Explosions (Gray and Orange), Lava and a Light Stand. These add to the Fire and Impact versions out last year so your displays should be much more dynamic soon. Rounding out the DBZ themed part of the event, we have new Zero and Zero EX figures. For Zero, we see new Radditz, Bardock, another Goku, and Vegeta. For Zero EX, we have SS Trunks and Super Buu. Overall a pretty solid DBZ showing, it’s gonna be a busy year if they actually all get released! Check the images after the break courtesy of AmiAmi. And then head on over to our sister site TokuNation for additional Toku & Sentai coverage of the Tamashii Nations event. Tamashii has posted images, info and a release date for their S.H. Figuarts Dragon Ball Z Vegetto. The fused form of Goku and Vegeta create one of the most powerful characters in the Dragon Ball universe. We first saw Vegetto at SDCC 2014, but little to no info was provided at the time. Now we have confirmation the Vegetto is being released in May, 2015. Vegetto will include swappable faces and hair, allowing for display in both regular and Super Saiyan form. The figure will also include effects pieces and a stand. The figure will be priced at 4,104 Yen (about $38 USD). Check out the photos after the jump. 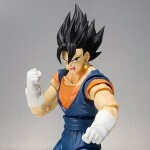 Be sure to check out our SH Figuarts Dragon Ball Z Reference Guide for more DBZ photos and info.